Before I get to the review I have many disclosures. I've known James for years and have worked with him on many stories in his job as a columnist for all sorts of folks including the LA Times, the Chicago Tribune and Chatelaine. We share a Canadian publisher and editor. I received a review copy of his book a while ago (and wrote a cover blurb for it), and he recently wrote a very kind review of my book The Diet Fix. I'm featured a bunch in Lose it Right. But wait, it gets even more conflicted. James is also one of those folks who by means of us working together on all sorts of stuff led us to even touch base outside of social media. James is a friend. So, now that all that's off my chest, I'll tell you a bit more back story. When I first "met" James he really lived up to his moniker at the time of, "In Your Face". That he was. James has a very in your face style of writing, but what became clear rather quickly, an in your face style of living. He's never short of an opinion, nor is he ever shy about sharing his with you. And that's not a bad thing, it's just James. When our shared publisher reached out to me to consider writing a blurb for James' book (and he mine), I was actually hesitant. My worry was simple. While being a huge fan of his writing style, and while it certainly seemed from what I'd read of his that our opinions were in line with one another, I worried about not liking his book. I didn't think it would be awful or anything, but given our long working relationship and our shared publisher, I wondered what I would do if I didn't love it. 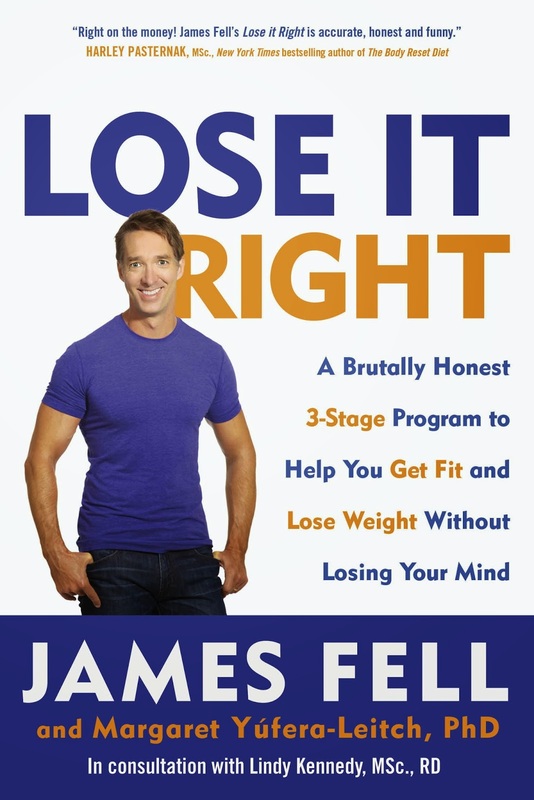 Despite my extreme familiarity with the subject matter, and despite having read truly dozens and dozens of diet books, I can honestly state that I have never had more fun reading one than I did reading Lose it Right. Its subtitle does it justice, "A Brutally Honest, 3-Stage Program to Help You Get Fit and Lose Weight Without Losing Your Mind" as that's really what it's all about. No bullsh*t, just straight shooting laced with James' humour and Margaret's evidence base. Their 3 stages are straightforward. The first is the background they feel will help to inspire your lifestyle changes. The second are the preparations you'll need to enact those changes. The third are the whats and the hows of the changes they're aiming you at. There aren't any real time frames attached to how long each stage will take, nor are there any nonsensical inflexibilities in their guidance. The crux of Lose it Right is that exercise, while not in and of itself useful in burning a whole boatload of calories, is essential in inspiring, fuelling and sustaining healthful lifestyles. They get into what they call the "virtuous cycle" whereby their theory is that exercise, "enhances ability to make wise food choices and makes you crave healthy fuel", and that said healthy fuel, "increases energy and positive attitudes about being active". And that definitely fits both with an evidence base that states that those who exercise more score higher on surveys of healthful living behaviours, and with my experiences working with literally thousands of patients trying to change their lives. Ultimately Lose it Right is a doable healthy living business plan (James is an MBA grad) that lays out not only what changes you have to make to open your healthful living business, but also the return you can expect on your investment, as well as the blueprints for how to enact change, and it's a plan I can honestly endorse. Should you want your own copy, here's an Indigo link and here's an Amazon link (its publication date is April 1st). So far it's only available here in Canada, though I'm guessing it'll ship wherever you might be.